Posted by M Bharath Bhushan in 1969, 29th State, AP Reorganisation Bill, Bhadrachalam, G.O 610, Hyderabad, Identity, JAC, KCR, Kothagudem, Koya, Mulki, Nizam, Polavaram, politics, Settler, Six Point Formula, Sonia, SRC, suicide, TDF, Telangana, Telangana Festivals, TRS, TSPSC, Warangal. 1. Historical Background: Telangana as a distinctive cultural unit in Hyderabad Princely State, its geographical, cultural, socio, political and economic features- People of Telangana- castes, tribes, religion, arts, crafts, languages, dialects, fairs, festivals and important places in Telangana. Administration in Hyderabad Princely State and Administrative Reforms of Salar Jung and Origins of the issue of Mulkis-Non-Mulkis; Employment and Civil Services Rules under Mir Osman Ali Khan, VII Nizam’s Farman of 1919 and Definition of Mulki – Establishment of Nizam’s Subjects League known as the Mulki League 1935 and its Significance; Merger of Hyderabad State into Indian Union in 1948; Employment Policies under Military Rule and Vellodi,1948-52; Violation of Mulki-Rules and Its Implications. 2. Hyderabad State in Independent India– Formation of Popular Ministry under Burgula Ramakrishna Rao and 1952 Mulki-Agitation; Demand for Employment of Local people and City College Incident, Its importance. Justice Jagan Mohan Reddy Committee Report, 1953 – Initial debates and demand for Telangana State-Reasons for the Formation of States Reorganization Commission (SRC) under Fazal Ali in 1953-Main Provisions and Recommendations of SRC-Dr. B. R. Ambedkar’s views on SRC and smaller states. 3. Formation of Andhra Pradesh, 1956: Gentlemen’s Agreement – its Provisions and Recommendations; Telangana Regional Committee, Composition, Functions and Performance – Violation of Safeguards, Migration from Coastal Andhra Region and its Consequences; Post-1970 Development Scenario in Telangana- Agriculture, Irrigation, Power, Education, Employment, Medical and Health etc. 4. Violation of Employment and Service Rules: Origins of Telangana Agitation– Protest in Kothagudem and other places, Fast unto Death by Ravindranath; 1969 Agitation for Separate Telangana. Role of Intellectuals, Students, Employees in Jai Telangana Movement. 5. Formation of Telangana Praja Samithi and Course of Movement – the Spread of Telangana Movement- Major Events, Leaders and Personalities- All Party Accord – Go 36 – Suppression of Telangana Movement and its Consequences-The Eight Point and Five-Point Formulas-Implications. Posted by M Bharath Bhushan in 1969, G.O 610, Godavari, Hyderabad, Identity, Jai Andhra, movement, Mulki, Nizam, Polavaram, Settler, SRC, Telangana, TRS, YSR. 1948: Indian Army annexes princely state of Hyderabad, which comprised different regions including Telangana. 1950: Telangana became Hyderabad State. 1952: First elections held in Hyderabad State. Nov 1, 1956: Telangana merged with Andhra State, which was carved out of Madras State, to form Andhra Pradesh, a united state for Telugu-speaking people. Posted by M Bharath Bhushan in Andhra, Andhrapreneurship, BJP, Congress, drama, Economy, G.O 610, Godavari, Hyderabad, Identity, Koya, MIM, Polavaram, politics, Settler, ST, TDP, TRS. The Andhra Pradesh Legislative Assembly was on Thursday abruptly adjourned till January 3 without even initiating the crucial debate on draft A.P. Re-organisation Bill 2013 that provides for the creation of a new state of Telangana. With no end in sight to the stalemate that the House was pushed into in the last four days, Speaker Nadendla Manohar adjourned the Assembly on Thursday afternoon, much to the chagrin of Telangana members who insisted on a debate on the draft Bill. The Speaker announced a fresh schedule for the Assembly session that will be held from January 3-23 in two phases – from January 3-10 and January 16-23 – and a circular to this effect was issued to the members. Posted by M Bharath Bhushan in agitation, Andhra, bandh, elections, G.O 610, Hyderabad, JAC, MIM, Mulki, politics, regionalism, Settler, Telangana, TRS. 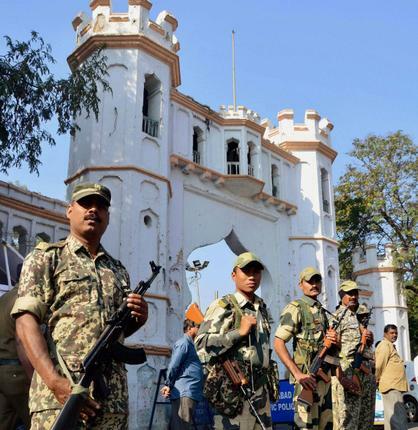 Is this the final war for Telangana? On 13 October, the indefinite Sakala Janula Samme or people’s strike entered its 30th day. The strike called by Telangana Political Joint Action Committee (T-JAC), a forum of political parties, students’ organisations, state government employees’ organisations and other JACs has paralysed the governance and economy in the Telangana region, that has for long been the hotbed of protests demanding statehood for itself. And it has not just been Telangana that has borne the brunt of shutdowns but the main city of Hyderabad too, especially the IT-based new economy. Posted by M Bharath Bhushan in Adilabad, agitation, elections, G.O 610, JAC, Karimnagar, Medak, Mulki, Nalgonda, Nizamabad, politics, regionalism, Warangal. HYDERABAD: The administration remained paralysed in Telangana region of Andhra Pradesh Wednesday as the indefinite strike by over 400,000 government employees continued for the second day. Delivery of civic services was hit in 10 districts of Telangana as employees stayed away from work to demand formation of separate Telangana state. The “people’s strike” called by Telangana Joint Action Committee (JAC) did not have much impact in Hyderabad, but was total in districts like Warangal, Karimnagar, Medak, Nalgonda, Nizamabad and Adilabad. Work in the state secretariat was not affected as about 85 percent of the employees attended their duties but the leaders of Telangana movement claimed that the employees from the region constitute only 15 percent of the total workforce. The impact was also partial in offices of other departments in the state capital. The strike led to tension in some offices in Hyderabad as a section of employees refused to join the strike. In the office of Hyderabad district collector, the supporters of the strike had heated arguments with those who refused to join them. Posted by M Bharath Bhushan in agitation, Andhra, Andhrapreneurship, bandh, cinema, Congress, Economy, elections, fast, G.O 610, Identity, KCR, KTR, Mulki, politics, regionalism, SEZ, Sonia, students, universities, youth. Posted by M Bharath Bhushan in agitation, Andhra, bandh, BJP, CPI, Economy, G.O 610, Hyderabad, Identity, Mulki, Muslim, politics, Settler, TRS. Normal life was thrown out of gear in Hyderabad on Thursday in view of massive traffic and security restrictions imposed by police ahead of the ‘Million March to Hyderabad’ called by pro-Telangana groups seeking introduction of a Bill on separate state in the ongoing Parliament session. Posted by M Bharath Bhushan in 1969, agitation, Andhra, Andhrapreneurship, bandh, BJP, conflict resolution, Congress, CPI, CPI-M, G.O 610, Hyderabad, Identity, JAC, Jai Andhra, livelihoods, Mulki, Parliament, politics, Rayalaseema, regionalism, Settler, Sonia, students, TDP, Telangana, Uttara Andhra. Sub: Creation of Telengana state – Obstructions imperiling Seemandhra people in and around Hyderabad. 1. The inclusion of Telangana to create the Andhra Pradesh state in 1956 had been from the beginning against the wishes of a majority of leaders from the region. The over 150 years of separation between the Telangana and the Seema-Andhra areas since 1800 AD has created unbridgeable gulf between social, educational economic mileus and political and cultural consciousnesses of the two regions. Vicissitudes of history have inflicted under-development and backwardness in the Telangana region under the Nizam’s rule. 2. The Seema-Andhra regions under the British rule had made considerable progress towards modernity and overall economic development, particularly in the fields of education, commerce and industry. The British regime had made its cultural impact too. The five and half decades of togetherness between the peoples of Telangana and Seema-Andhra regions in the integrated state had failed to bring equitable development in the different regions of the state and harmonize the relations between the peoples. It is an undeniable fact that the people of Telangana have always been nurturing a feeling that they are being ruled over and are denied self-rule. The separatist sentiment that had its roots in the Telangana region of the erstwhile Hyderabad state have been periodically surfacing ever since the formation of Andhra Pradesh. The sentiment as expressed in the 1969 Separate Telangana agitation was suppressed by strong-arm tactics and by luring some separatist leaders with power. The same had happened in 1972 Separate Andhra agitation too. 3. The separatist agitation in Telangana, largely peaceful till now, has been going on for almost a decade with increasing support from the people. While the 1969 agitation was mainly an urban phenomenon, today it has reached every nook and corner of Telangana and stirred the emotional feelings of the common people. The movement for separate Telngana is irresistible and cannot be simply wished away or suppressed by strong-arm tactics. Posted by M Bharath Bhushan in agitation, Andhra, Andhrapreneurship, bandh, Congress, CPI, drama, G.O 610, Identity, Mulki, politics, Settler, students, TDP, Telangana, TRS. HYDERABAD: After raising heat and dust for 16 days with their non-cooperation stir, Telangana employees called it off on Friday, accepting everything that the government was willing to give them on day one. Observers are asking why the stir was called off so abruptly. The withdrawal has driven a rift down the middle of Telangana ranks. Employees associations in Warangal and Karimnagar are preparing to buttonhole leaders of TJAC with some questions. Telangana Employees Association Warangal president B Janardhan said, “We will go to Hyderabad on Sunday and ask Swamy Goud and Prof Kodandaram,” he said.